Evelyn Mulwray: It's a handkerchief! Jake Gertz: I said I want the truth! Evelyn Mulwray: A handkerchief, a map. Evelyn Mulwray: It's a handkerchief AND a map! 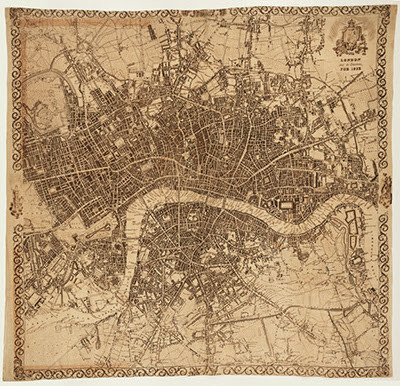 The Travelling Handkerchief has come to town, Fairburn's Map of the Country Twelve Miles Round London by E. Bourne, printed on calico, 590 x 540 mm, in 1831, a scarce, early handkerchief map. The map is circular, and reaches Teddington in the south west, clockside to Norwood, Harrow on the Hill, Chipping Barnet, Dagenham, Purley and Kingsston, wherever they are. I'm in Los Angeles, clockside to Westwood, harrowing on Barrington, Pico and Sepulveda; what do I know? This cartographical Kleenex™ is decorated by vignette views of Chelsea and Greenwich Hospitals in the bottom corners, and a banner heralding the title is held aloft in an eagle's beak. Samuel Hill's engraving of Andrew Ellicott's plan. Printed in Boston, c. 1792. Handkerchief maps date back to the late 18th century. Examples featuring the plan for Washington D.C. werre sold as "'an authentic plan of the Metropolis of the United States,' advertised as an accurate guide for the prospective purchaser of lots but also as 'a very handsome ornament for the parlor or counting room" (Luria, Capital Speculations: Writing and Building Washington, p. 14). These handkerchief maps are believed to have been printed in Boston in 1792 in connection with "the sale of lots in the new 'Federal Town'" (Works Progress Administration, Washington: City and Capital, p. xiv). Engraved map, printed on silk. 650 x 610mm. sent their fleets to blockade St Petersburg. Kronstadt, naval scenes and French and British coat-of-arms. 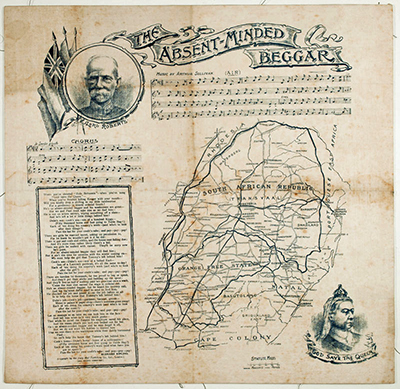 During the 19th century, the British Army's Quartermaster-General Department in India issued handkerchief maps of Delhi and Attock for use by their troops, and they were published as souvenirs during the Crimean War. London, the Daily Mail Publishing Co. Ltd, c.1899. Linen handkerchief printed in blue, 460 x 470mm. to rise funds for the "Soldiers' Families Fund"
after the outbreak of the Second Boer War (1899-1902). Guildhall Library in London has an example of The Travelling Handkerchief in its collection and of another handkerchief map scarcity, An Illustrated Map of London, published in 1850. London and its Environs for 1832. Engraving on cotton. 915 x 890mm. Handkerchief maps were issued to U.S. Air Force servicemen during WWII as escape maps if shot down over enemy territory. On acetate rayon, linen, or silk, they were lightweight, waterproof, hard to tear and tough to disintegrate; they were able to take a beating yet still fulfill their purpose. The British also issued handkerchief maps to their air force crews and ground troops in all theaters of operation. The Helen Louise Allen Textile Collection at University of Wisconsin has sixteen mid-20th century handkerchief maps of U.S. states, Canada, the 1939 World's Fair, etc. in its collection. 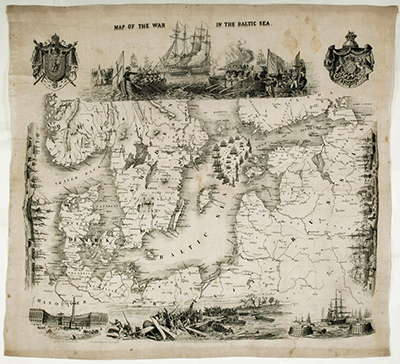 Surviving eighteenth and nineteenth century handkerchief maps in collectible condition are quite rare. Jake Gertz: My nose is bleeding, gimme your handkerchief. Walsh: Forget it, Jake, I'm lookin' for Chinatown. It's on here somewhere. BOURNE, E. The Travelling Handkerchief. 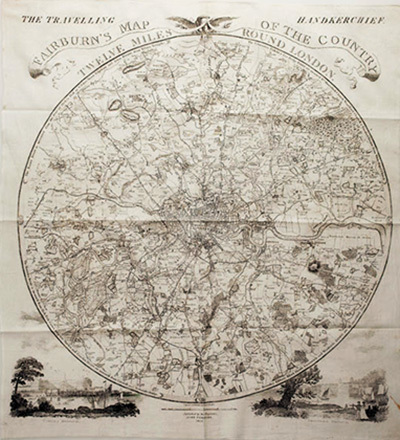 Fairburn's Map of the Country Twelve Miles Round London. London: John Fairburn, 1831. Engraved map printed on calico. 590 x 540mm. The Travelling Handkerchief and other British handkerchief map images courtesy of Altea Gallery, with our thanks. 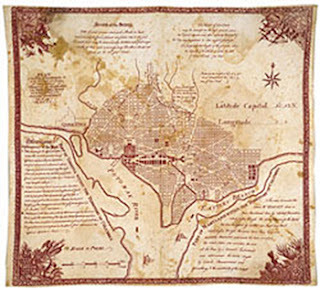 Image of Washington D.C. handkerchief map courtesy of George Washington University GW Magazine, with our thanks.